Music & Entertainment – live bands and/or killer jukeboxes, other performances and literary events. On that first warm day of the year in Chicago that occurs sometime between March and July, nothing beats the beer garden at Sheffield's. The bar also features an impressive selection of beer (and wine), "barbeque in the back room," literary events, expressionist artwork, and classic Chicago architecture augmented by recent renovations and additions. When I am asked, "If you could only go to one bar for the rest of your life, what would it be?" For me, the answer is Sheffield's. Now over 100 years old, the Green Mill Cocktail Lounge is the crown jewel of Chicago's Uptown neighborhood and is the best jazz club in the known universe. Green Mill is a place for people of all walks of life to relax, enjoy martinis or Schlitz, and listen to some of the best music around, from traditional jazz to swing orchestras. The Green Mill even hosts the longest running poetry slam, every Sunday night. Inspired by the Moulin Rouge in Paris (Red Mill), the Green Mill has attracted many celebrities through the years from Charlie Chaplin to Al Capone to Frank Sinatra to Bill Gates and has been filmed in The Untouchables, High Fidelity, and the 80s TV series, Crime Story. After much resistance, Uptown has finally succumbed to the regentrification surrounding it for the past 15 years now that Starbucks moved in. One has to wonder if this would have been possible if owner Dave Jemilo hadn't rescued the Green Mill from squalor in 1986 and restored its former luster, both in terms of décor and in hosting the best jazz around – a tradition that dates back to the club's beginning, so many moons ago. Well, the secret is out: one of the best neighborhood bars in Chicago is not in Lincoln Park, Bucktown or even Lakeview. It's in the far north Chicago hamlet of Andersonville, and its name is the Hopleaf Bar. Locals know it simply as "Hopleaf" and desperately try to guard its eroding anonymity from those bar-hopping further south. Even though the weekend crowds can get brutal, Hopleaf remains true to its design as a very cool neighborhood joint that draws its loyal and increasing following from its laid-back vibe, tasteful decor, eclectic music, the best steamed mussels in the city, a most pleasant outdoor beer garden, and one of the best "hop" selections in the city with Belgian beers (even trappist ales) on tap as their specialty. Since 1992. This original Goose Island location on Clybourn is one of the most universally loved pubs in all of Chicagoland. Those who are hungry will appreciate the endless rotation of hand-crafted brews made with superb quality. Those who hunger will appreciate the well-designed menu that provides the ideal accompaniment to the fine selection of ale. Those who are bored will appreciate the pool tables, the Golden Tee and the general camaraderie that accompanies a room full of people getting sauced on some of the best beer they've ever had. 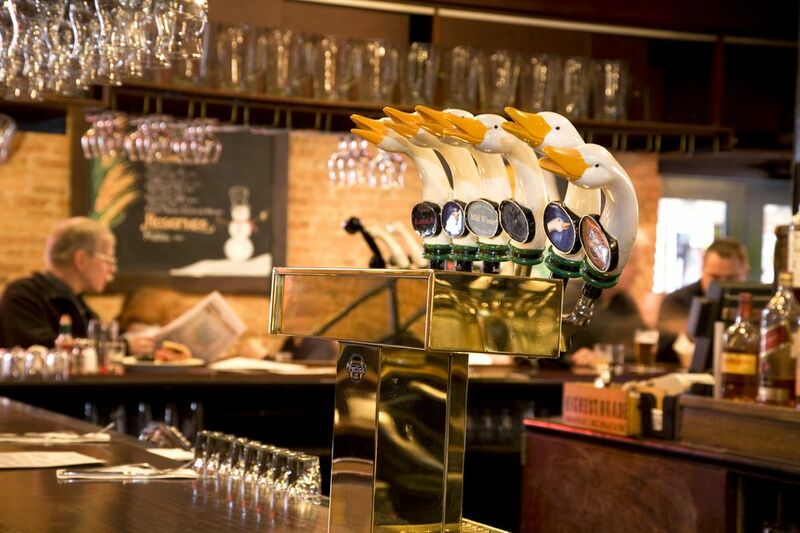 As a result, few pubs in the city are more talked about, recommended, or more frequented by locals and travelers than the Goose Island Brew Pub since it opened in 1988. While their newer location in Wrigleyville is hard to beat after a Cubs game, the original location remains a true Chicago classic. While being cheaper than a trip to Edinburgh and more pleasant than a poke in the eye, the Duke of Perth is the best Scottish pub in Chicago. Okay, it's only one of two Scottish pubs in Chicago, but it's still pretty cool (and we like Ole St. Andrew's Inn further north as well). And folks, it's a pub. There are no televisions at the Duke, so you may have to talk to somebody. Known for its $8 all-you-can-eat fish and chips on Wednesdays and Fridays, 90 blends of single-malt scotch (best variety in Chicago), and very cute waitresses (hand-picked by the owner), the Duke has something for everyone and their brother – which causes the pub to get very crowded, so get there early. Since 1989. Ever hear of the "Curse of the Billy Goat," also known as the Cubs Curse? Remember reading about Mike Royko's favorite place in his nationally syndicated column? Or, do you recall the Saturday Night Live sketch in which a short order cook would yell out to incoming patrons: "Cheezborger! Cheezborger! No fries, cheeps! No Pepsi, Coke!"? All of the above have one thing in common: the Billy Goat Tavern. Because of its subterranean location beneath the Chicago Tribune Building, the present location of the Billy Goat has been an underground oasis for journalists and tradesmen seeking a break from sobriety during lunchtime and after work. Many of them became regulars as colorful as the original owner, William "Billy Goat" Sianis, and his nephew and current owner, Sam Sianis. Legions of tourists also descend upon The Goat to get yelled at and to enjoy some of the best burgers in the city. As a result, the Billy Goat Tavern has become a true Chicago classic and required stopping point for both hungry locals and visitors wishing to gain some insight into the City that Works. No other bar in Chicago can match the storied past, unique décor or atmosphere of the John Barleycorn Memorial Pub. "Barleycorn's," as it is known to locals is incredibly conducive for conversation and libations, offers up a tasty selection of pub grub, and has one of the best beer gardens in the city. If that's not enough for you, perhaps you will enjoy the statuary, model ships, classical music, or slide show depicting an impressive variety of objects d' art. Oh, and did I mention that Barleycorn's was also a speakeasy during Prohibition with a Chinese laundry as a front? The Twin Anchors stands out as one of the most notable rib joints in the city. Especially impressive is that Twin Anchors remains unknown to many, even though it has been in business for over 75 years and has served what many claims are the best baby back ribs in the city. While many suburbanites and conventioneers stick with the steakhouses further south, Old Town neighborhood-types and savvy North Side diners pack the place almost every night. Add to that patronage from Old Blue Eyes himself as well as other local celebs, its feature in the Minnie Driver and David Duchovny film, Return to Me, and Twin Anchors has become a Chicago Historical and Architectural Landmark in this beautiful area of town known as the Old Town Triangle District. The Twin is also a great place to have a cocktail and listen to the Rat Pack on the jukebox. Southport Lanes & Billiards is excellent for so many reasons. In addition to its maple bowling alley and billiards on regulation-size tables, the place serves excellent pub grub, offers a great selection of craft ales, has the best tavern bathrooms in the city, and has a sidewalk beer garden that rivals those found up & down the lively Southport Corridor. Southport Lanes was built by the Schlitz brewery in 1922 as one of the hundreds of "tied houses" in the Midwest (only Schlitz beer was served), and operated as a speakeasy during prohibition with a brothel upstairs advertised by M.K. Siegner’s murals depicting nymphs frolicking in negligees, still found today in the main bar and bowling lanes. Moody's Pub is one of the best Chicago bars that you've never heard of. Located in the heart of the Edgewater neighborhood at Broadway and Rosedale, not many people beyond Loyola students know it's there. But, there it is in all of its dark wood and brick glory. Not sure you want to head up to Edgewater to check out the place? Perhaps you should consider that Moody's serves up one of the best burgers in the city, the Moody Bleu. Still not convinced? How about this: Moody's has one of the largest and most pleasant beer gardens in town, and has one of the most comfortable, fireplace-heated rooms in winter. Combined with a laid-back atmosphere and cheap prices, Moody's is hard to resist if you can motivate yourself to get up north. Since 1967 (originally located in ​Old Town).